1. Cook the greens in a large pan of boiling water for 4-5 minutes then remove with a slotted spoon. Add the tagliatelle to the water and cook according to pack instructions, until tender. Drain, reserving a little of the liquid in the pan. 2. Add the mascarpone, mustard, capers and nutmeg to the pan and heat for 1 minute. 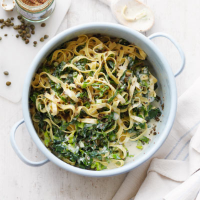 Season, stir in the greens and tagliatelle and serve.